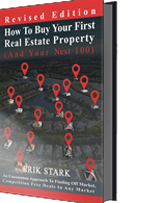 Our guest for this week’s show is Real Estate Investment and Direct Marketing Expert, Erik Stark. Today’s discussion with Erik is an exciting one, and I say that because I wasn’t completely sure what to expect as I didn’t know too much about Erik prior to the call other than he was a very successful investor whose primary focus was residential properties, so I thought. And being that our show is primarily focused on Commercial I wasn’t sure exactly how our conversation would go, but boy am I glad we did the call together, because not only is Erik a brilliant businessman and marketer, but he also has a portfolio of multifamily and commercial properties which means he is the exact type of guest we look to bring on the show. I personally walked away from this interview with Erik with multiple golden nuggets which we’ll be immediately implementing into our business and I’m positive you’ll find the same value as I did, and then some. How I got my start as a residential wholesaler back in 2008 during the financial crisis and how we leveraged that down market to grow our real estate business at a very rapid rate. How I’ve combated a highly competitive marketplace by implementing an aggressive direct mail strategy, which has proven very successful in creating a steady stream of deal flow to his business. The reasons I recommend sending a highly personalized direct mail letter to a very small list versus a generic form letter to a massive list and how this one strategy has continued to bring incredible results for his business. How to successfully negotiate and strike a deal with an owner who is not money motivated and whose property isn’t even for sale. What a “top 100 list” is and why every investor needs to create this list for themselves. How to use a pre-recorded message to warm up cold leads and also offer an easy way for property owners to get more information about our business without having to speak to a live person. The letter we send to surrounding property owners once we’ve purchased a property within the same neighborhood and how this one method alone has resulted in multiple additional acquisitions for our group. How I was able to turn a disgruntled property owner who was sick and tired of receiving our direct mail into a friendship that has brought him multiple investment opportunities, capital for deals, not to mention a mentor who had 50+ years of experience in the industry and who has become an invaluable resource to our team. Why we love the Detroit market and the reasons you should add it to your list of “cities to consider investing in”. The important role a mentor played in my overall success and why a good mentor is critical to your success in this business. The one Dr. Seuss book that I suggests will change your life and is one of the best business books I’ve ever read. Previous PostPrevious The Horsepower Of Leverage With Erik Stark.